In the interview, I talk to Yerxa about our recent neglected fields forums, and the September naval history forum in particular. 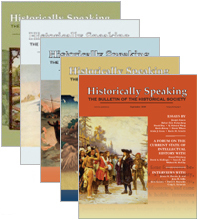 Yerxa also describes some of the ways that Historically Speaking has changed since he and senior editor Joseph Lucas came on board in fall 2001. HS aims for the general, educated reader, and tries to avoid jargon or the insider language of subfields, says Yerxa. He reflects on the niche the magazine fills and offers some examples of its success.